Last summer, Prout together with UPP, held a petition for psychological support for UU PhDs. We collected more than 1000 signatures, which we handed to UU rector, Henk Kummeling. The university decided to start a 6-month trial for a PhD psychologist! The PhD psychologist offers psychological support when it comes to psychological problems caused by the doctoral degree trajectory or that have a direct effect on the trajectory. The PhD psychologist is specialized in short-term treatment for anxiety issues, mood complaints, concentration problems, fear of failure, motivational issues, etc. The PhD psychologist is available for all PhDs at Utrecht University (up to one year after contract ending) and is well aware of the unique position that PhD candidates are in. Therefore, he is able to offer adequate assistance that is specifically tailored to the PhD candidate. An appointment can be made using the following link: https://students.uu.nl/en/schedule-an-appointment-with-phd-psychologist . Depending on the specific support need, there are a number of options after the intake: one-off advice/ information, (short-term) individual counselling, group sessions or referral. There is a one off charge of 25 euros for the intake. Everything that is discussed will remain strictly confidential. The PhD psychologist can be reached by phduu@uu.nl. As of the 14th of January 2019, Hora Est has been replaced by MyPhD, which is the new PhD-candidates monitoring system of Utrecht University. All processes related to the dissertation, from the admission to the PhD track to submitting the dissertation, are registered in this system. Manuals for MyPhD can be found here. Today, October 24th 2018, the petition for psychological support for UU PhDs was handed in to the rector of Utrecht University. In the meeting, the organizers of the petition discussed with the rector the importance of PhD mental health and what will be the next steps to address this issue at UU. 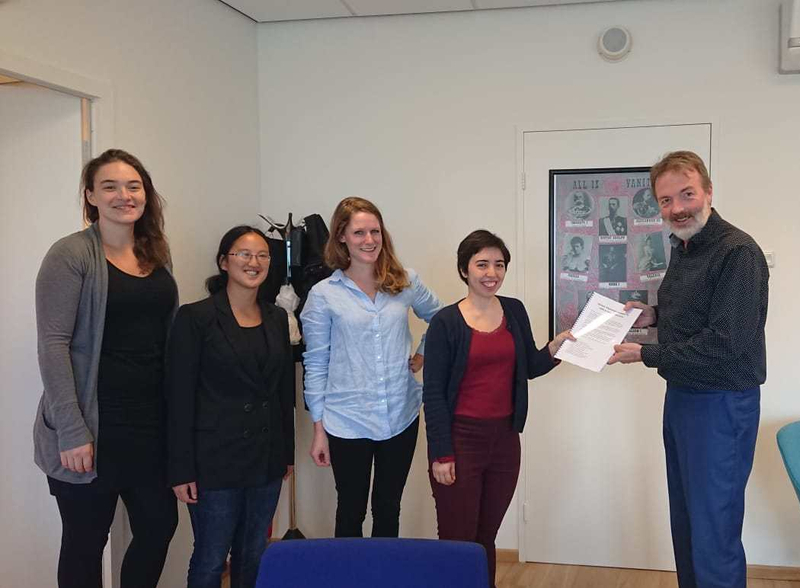 We were glad to hand in our petition with 1000+ signatures for PhD mental health support to the UU rector, Henk Kummeling. The rector said he was concerned with PhD wellbeing and mental health, and agreed to discuss with us concrete scenarios for offering mental health support in November, and to have a final decision in December/January. The rector also said that the help should be provided by trained psychologists. 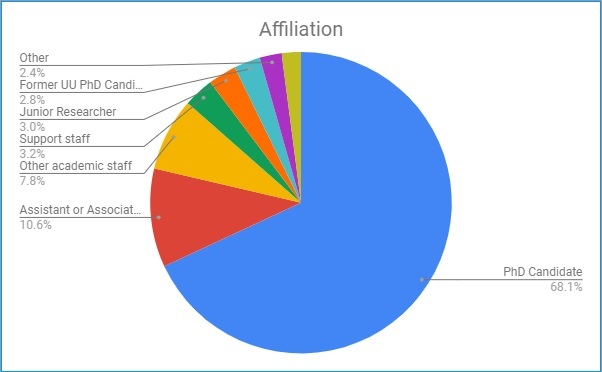 The petition ran from June to October 2018, and gathered 1021 signatures across all faculties of the University, from PhD candidates (695), all levels of academic staff (e.g. 21 Professors, 108 Assistant or Associate Professors), support staff (33), and alumni (29 former PhDs) (see below). We are glad with the support of so many people for a topic that is still very much taboo, and we were especially touched and encouraged by the many comments people left on the petition, sharing their personal experience, and adding other good arguments for the university to care more about its employees. Outdated – we have now more than 1000 signatures! On June 13th Prout launched, together with UPP, a petition for psychological support for PhDs to be implemented at UU. 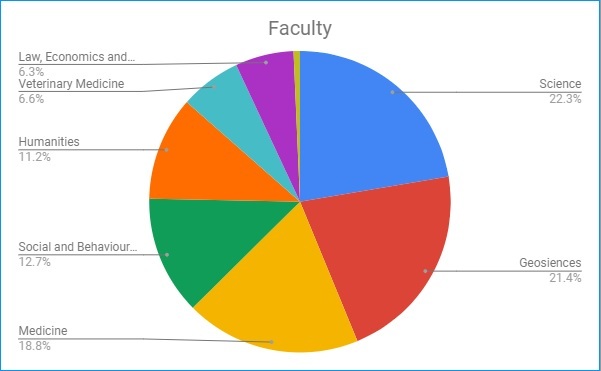 By mid-September we reached more than 700 signatures, from all across UU, including PhDs but also Professors, Assistant and Associate Professors, other research and support staff, and some ex-PhDs and alumni. Here are some statistics from September 18th (731 signatures). Update: by September 27th we have more than 900 signatures. Update 2: The petition closed on October 3rd, with more than 1000 signatures. An update with final statistics will follow. Can we display your name in the petition? More than half of the people have shared why they signed the petition. Many PhDs mentioned that they signed the petition because of personal experience. Others explain how it is in the interest of the university to support the mental health of its employees. Here are some of those comments. You can sign and read more about the petition here . If you would also like your comment to be published here (with your name, or anonymously) contact Ana: ana@prout.nl. The petition is open for signatures until the end of September 2018. On June 13th, PhDs at Utrecht University launched a petition for psychological support to be available for PhDs at the university. While mental health issues are prevalent among PhDs, a proper support system is lacking. This need is reflected in the large number of signatures (more than 250) collected in one week. The petition is supported by PhDs (62%), and by UU staff from all levels of the university. The petition follows two actions by the two UU-wide PhD organizations: Prout – PhD Network Utrecht, and UPP – Utrecht PhD Party. Prout and UPP have coordinated the first symposium on PhD mental health at Utrecht University in January 25th 2018. This was followed-up by a guide for PhDs, and a letter with 10 recommendations for PhD well-being, sent to the UU board in March, and strongly supported by PhD councils. In early April, the UU board responded to the letter in a university council meeting. The UU board expressed their understanding and willingness to implement the recommendations, all except for the first one: “Appoint a full-time PhD psychologist – make it easy for PhDs who are struggling to get specialized professional help”. It was reasoned that providing healthcare is not a core task of the University. According to the UU board, PhDs should follow the current procedures, i.e. consulting with the company doctor (bedrijfsarts), and with the social workers (maatschappelijk werker). The board said it would look into the possibility of training the company doctor and social workers in specific PhD issues. However, considering the prevalence of mental health issues among PhD candidates, there is a need for specific psychological support services. While UU students can go to the student psychologist, PhDs can only meet with social workers, or with a confidential advisor. For mental health problems, they are forced to seek help outside the university. Comments to the petition show that many PhDs feel or felt the need to have mental health support during the PhD. Some mention that when seeking help outside, general psychologists do not understand very well the particular situation of doing a PhD. Having dedicated psychologists and sessions for PhDs at UU would be the best-suited approach, following the steps of other universities: TU Delft appointed a PhD psychologist, and UvA made the student psychological services available to PhDs. In sum, paraphrasing petition comments, doing a PhD is not only an intellectual, but also a mental challenge, for which support from mental health professionals should be available. Ultimately, it is also in the interest of the university that PhDs are healthy and able to finish. Providing psychological services would acknowledge the importance of mental health, and contribute to a healthier work environment at UU. While 250 signatures is a good start, we would like to collect many more in the coming months. So, please share it around, and let us know if you have any questions! Read and sign the petition here: http://bit.do/PHDpetition. On April 9th we heard the response of the UU board to our letter of recommendations, during a university council meeting with Anton Pijpers, the chair of the UU board. The UU board understands most of the recommendations and they have added it to the Graduate Agenda (the general plan of how to improve the PhD phase at UU). They were less enthusiastic about appointing a psychologist, but they said they will ensure that the social workers are sufficiently equipped to deal with PhD issues. They will also investigate how to make transferable skills courses more accessible to everyone, regardless of which graduate school you belong to, or what your budget is. We are happy that the UU board agreed with almost all of our recommendations (except the PhD psychologist – the first recommendation on our list). We have agreed to re-evaluate these measures with the UU board in October, to see if they are sufficient. However, we still think that it would be very important to provide psychological support to PhDs at UU, so we decided to start a petition! You can read it and sign it here. Prout is organizing an Information Market for PhD Candidates about all you need to know about the final stage of your PhD, such as defending your dissertation, printing your thesis and more. There will be a number of printing companies present that will offer their services to you, allowing you to compare their offers. In good Prout tradition, we will conclude the event with drinks! Come get a helpful info sheet with tip and tricks for your defense, and/or negotiate a good price for printing your thesis on Thursday 14 June from 17:30 to 20:00 in the foyer of the Educatorium! You can drop by at any time. On January 25th 2018 we raised attention to the issue of PhD mental health at the “Keeping sane in your PhD” symposium. After all the inspiring and constructive discussions it was time to bring the issue to greater attention of the whole University. With all the input from the symposium we – Prout, UPP and a representative from the Life Sciences PhD council – wrote a letter to the board of Utrecht University with 10 recommendations to improve PhD wellbeing. Read the full letter here. These recommendations will be discussed with the UU board, on April 23rd (15h00-17h00) in a university council meeting (Bestuursgebouw room 0.33G). You are most welcome to attend! Here’s the FB event. The more people show up, the better! 1. Appoint a full-time PhD psychologist – make it easy for PhDs who are struggling to get specialized professional help. 2. Offer free courses on transferable skills – these courses can optimize the PhD process, as well as strengthen skills that are valued outside of academia. 3. Be transparent about requirements for PhDs – “make the implicit explicit” regarding duties and rights, including (in)formal rules that are UU-wide and specific requirements of departments. 4. Properly implement a PhD mentoring system – each PhD should have an appointed mentor. The mentor should be a neutral person, with whom the PhD can talk about the process of the PhD. Mentors should proactively check on PhDs (once/twice a year). 5. Offer training to PhD supervisors – encourage supervisors to take courses on PhD supervision. 6. Monitor the quality, satisfaction and problems of PhD supervision – at the moment PhD supervision is not adequately assessed. Finding ways to systematically monitor supervision quality would help to develop processes to solve problems. 7. Instate career coaching for PhDs focusing on academic and non-academic careers – the availability of career officers, career-minded trainings and events can decrease the anxiety linked to a future career. 8. Organize introduction sessions for new PhDs, creating Graduate School PhD cohorts – this can be partly UU-wide, and partly the responsibility of faculties/departments. Having cohorts of PhDs starting at the same time contributes to social cohesion. 9. Create a welcoming and inclusive environment, explicitly including internationals – e.g. from UU and faculty communication (in English), to an active culture of inclusion within each department. 10. The whole UU is co-responsible for ensuring that a proper support system is available to all PhDs – the above stated measures would constitute such a support system, which can only be built with the engagement of all UU, from the higher to the most local level: UU management, faculties, graduate schools, departments, and research groups. How are you feeling? According to several studies about one-third of us is feeling depressed. Could it be you? Don’t be embarrassed, you are not alone! Talk about it so people can help. In response to the prevalent mental health problems among PhDs, Prout organized a Mental Health Symposium together with UPP and GSLS. Read the article to find out what came out of the symposium. The need for mental health support is also recognized at other universities. For example, TU Delft has a fulltime PhD psychologist who was recently interviewed by the NRC. The UVA will start a project to improve the mental wellbeing of their PhDs, which includes an online screening and prevention tool for common psychological issues, a health week with activities for mental and physical health, and psychological consultation. These are promising developments and set an example for other universities. Now, it is time for Utrecht University to invest in your mental wellbeing. This was one of the conclusions of the PhD mental health symposium that brought together 130 PhD candidates and UU policy-makers to discuss what can be done to improve PhD wellbeing. Check the summary of the event, the presentations, and other resources on our website. A result of the symposium is the PhD wellbeing guide: collective wisdom on how to keep yourself happy in your PhD and life. The guide also mentions what the university should do to improve PhD wellbeing. Have you ever entertained the idea of becoming an entrepreneur? Prout and the UU-wide start-up incubator, UtrechtInc, are organizing an event for PhD’s who want to know more about building a start-up. A interactive workshop given by a coach from UtrechtInc will provide practical examples and fresh ideas for interested participants. Come join us on March, 22 at 4:00pm – ± 6:00 pm at UtrechtInc, Padualaan 8. Registration is required. This March, Prout, in cooperation with tax advisors of the Federation of Dutch Trade Unions (FNV), will hold an interactive tax advising session for PhDs. Do you know what all your rights and responsibilities are as a taxpayer? Could you use the advice of a professional? Then register for the Tax Lecture! Sessions are held for both Dutch and foreign employees. Join us on March 8th, 17:30-19:00 at the Janskerkhof 2/3. Click here for more details and to register. At the University of Utrecht, we have an ombudsman: Paul Herfs. With him, PhD candidates can discuss sensitive and confidential issues such as performance review, dismissal issues, problems affecting PhD candidates, working conditions, returning to work after chronic illness and clashes with colleagues. Would you like to know everything on getting your booklet printed? Family business Ridderprint will give a workshop in which they will explain the ins and outs of getting your dissertation ready to be printed. They will instruct you on important aspects, such as how long the process takes, what options are available to you and how you should prepare the document prior to submitting it for printing. It’s on! On Thursday 12 April from 16:00-17:00, in the Van Unnik building, room 210, with drinks afterwards in the Basket. Please register for the event here! Want to spread your knowledge outside of your scientific bubble? Here is your opportunity to give a layman’s talk! De Booghkring is society for higher educated people with acquired brain impairment. This society organises monthly Science Cafés in Leidsche Rijn and they are looking for researchers who can give a lecture in Dutch. For more information, visit their webpage, or email Miranda Thoen. Do you think it is important to talk about your research to a general audience? And would you like to learn how to do that effectively? Then we have a unique opportunity for you! The Public Engagement Programme of Utrecht University is piloting a training series especially aimed at PhDs. The pilot consists of four training sessions and a grand evening to showcase your newly acquired skills. More information can be found here.